Media playing software are many but those that exhibit the two in one facility of playing and converting the files into other formats are few. And if you are in need of such media playing software we help you come face to face with EZ WAV Player 1.1, a fine tool you just cannot deny. EZ WAV Player is equipped to play all your audio files stored in your PC in WAV formats. Besides playing the WAV audio files, it can also convert your favorite song or music files in a range of other formats. EZ WAV Player has a very simple user friendly interface that can aid non technical users to effortlessly navigate through the software and carry out the operations. This converting software program is available in the internet that can be easily downloaded from the internet and get installed hassle freely. This version of EZ WAV Player supports a varied amount of formats such as WAV PCM, WAV ACM along with MP3, WMA and many more. You just need to add your favorite audio files into the software and check them in the list and click the convert button to see the conversion easily carried out. The item editor that is available with this tool will provide you with all the details you need to know of the items of the list. 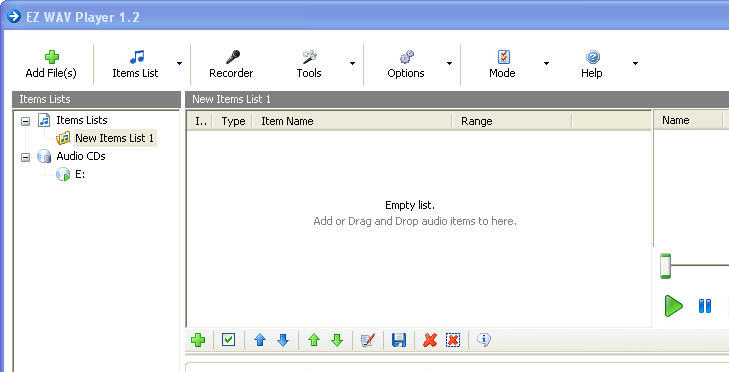 More over it will assist you to set the ID3 tags of audio files you have converted. Regarding the quality factor you can blindly trust this fine program as it make sure the output file is properly synchronized. The preview option also lends an additional hand to obtain finest audio files you want after conversion. EZ WAV Player with so many features brings with it and has every reason why you should go for this converting application. The application earns a score of three rating points for its ease of use and robust performance. EZ WAV Player 1.0 is software for windows that allows you to play and to convert WAV ACM, WAV PCM, MP3, WMA and more audio files, easily, fast, with an high quality results.With the wav graph of the Audio Analyzer of EZ WAV Player 1.0 you can display and edit ACM, PCM, WAV, MP3, OGG, WMA easily, with a few mouse clicks only.With the events operator of the EZ WAV Player you can operate many events when the process has finished.